“Game Over” by Derek Edgington takes place in the virtual universe of Elisium. The story begins with the game loading and opponents preparing to go into combat. The author has a creative imagination and “Game Over” is geared toward those who love this type of action. This is a somewhat “choose your own adventure” book for some of the scenarios. One could make good choices that would lead them to move on, or wrong choices that would mean game over. Only the most skillful will move on. While reading this book, there were several things that came to mind as a reviewer. First off, let me say I am not a gamer, nor do I have any extensive knowledge about the subject. That aside, there were so many characters in this book I found it difficult to keep up with them all and I didn’t have the energy to thumb back through the pages to figure out who was who. Transitions between chapters were quite confusing, and toward the book seemed to lose steam toward the end. Even discussing this book with my son and his friends who are gamers, they too seemed confused as to what the goal of the writer was, and which characters he wanted to focus on. Based on writing any book, I always recommend that all authors and potential authors use an editor. This helps in transitions, ensuring the storyline and voice is consistent throughout the book. My belief is that this might have helped this storyline in its presentation and flow. I certainly understand that there are technical words that need to be included in a book of this type, but if it isn’t clear what the writer is saying or is trying to say, readers will lose interest quickly. Writing a book on gaming would seem difficult given the information that would need to be provided, but writing one that reads like an actual virtual game requires a special talent. Edgington seemed to know what he wanted to present, however, he just didn’t get it down pat in the wording. This book just didn’t give me what I thought it should in several areas. I spent most of my reading being confused, and again that might be since I am not a gamer. 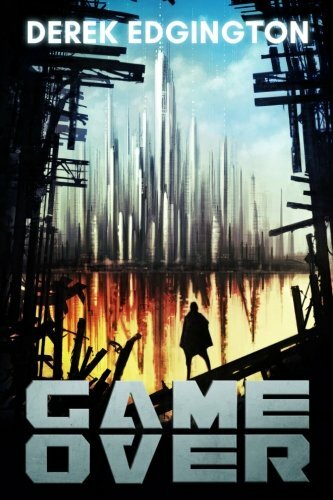 Derek Edgington gave it his best shot in “Game Over.” While in my opinion this book missed its mark, I do believe Edgington has potential to be a good writer, and finding an editor to help with the transition and consistency issues will prove immensely beneficial going forward.